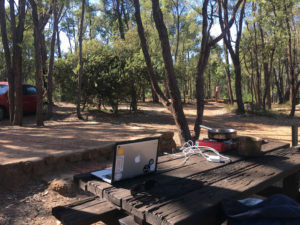 At the end of August, I spent a week living and working from a campsite or hour or so from my home as an experiment in what the future of work might look like. These are my notes. A lot of the work I do is location independent (this is increasingly becoming a thing), as long as I have access to internet and power for my phone and laptop. This was an experiment in seeing if it was logistically feasible to move my office to the forest for an extended period, and if it would help my creativity and productivity (it did!). I’ve already been experimenting with working remotely from Ubud (Bali, Indonesia) on and off for the past year or so, with the goal of bringing more balance, mindfulness and creativity to my life (you can read about those adventures here, here and here). I always feel more happy, healthy, creative and productive when I’m in nature. According to Japanese scientists, this is actually a thing. I have a longer piece coming out about benefits of forests in Particle (think, innovation spaces of the future! ), so I’ll post that here once it’s up. Went for an 1+ hour walk in the bush everyday. Had client meetings via phone — which made no difference to my interstate clients. I also found directing meetings to the phone rather than in person saved a lot of travel time. I’ve started doing more meetings by phone as a result. Had a client meeting that was done better in person at a cafe in a nearby town. Wrote this piece on the science of yoga for Particle. Booked to give a workshop in Sydney. Went to bed earlier and slept better. A low level cold/flu I’d had for weeks finally cleared up. Even though I went for a long walk everyday I didn’t do my regular yoga/crossfit classes, so I think I got a bit more chubs. See also bigger appetite. Still worth it though. Came up with a bunch of new ideas and got unstuck with others. Generally felt happier, more positive/resilient and more creative. Overall: 11/10 Will Do Again. Not necessary, but it’s a lot easier if you have a camper rather than a tent, especially if you want to keep working on colder, rainy days. Depending on how long you want to do it and if you are going to meet clients at some point, showers and laundry are also a bonus (for reasons which are obvious!). My campsite had both. The usual camping stuff, tent, gas stove, cooking gear, sleeping bag, sleeping mat etc. Also baby wipes. You can never have too many baby wipes.